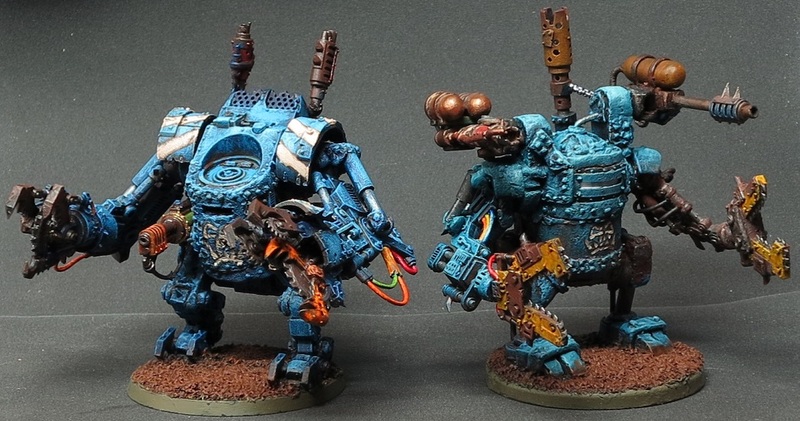 Looks like you had the same idea as me with that middle kan - is he made from a Stompa turret? The painted one in the top pik of post #218? - that one's Milliputted tinplate with a trukk turret and wrekking ball topped off with a 1/35th scale truck wheel. Oh, and I love the Wall-E eyes on the front right! I really like his olden-days plasma cannon (?) too. awesome man. I've stumbled upon 21 kans myself while tidying up. Yours are an inspiration! 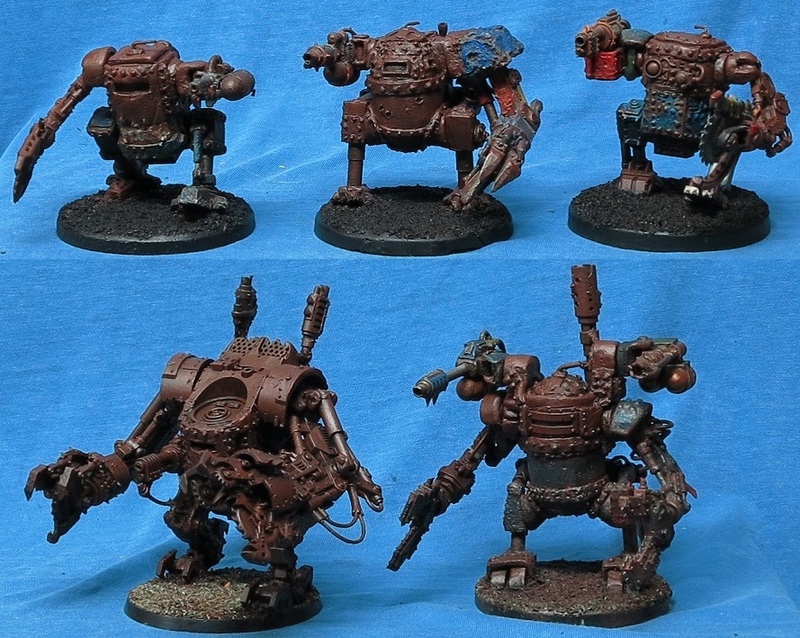 Cheers, tidying up is a really useful source of bitz (and thanks for the likes chaps ). Absolute beast of a mini, even more impressive in the flesh. I would be too, he's great! Honestly - I just love Wazdakka and his old-school mega-armour. This is what I want to do for my MANz, but I don't have the green stuff skills. At least I can look at what you've done. I really dig the shoulderpad glyphs, and the little mek spanner on his right shin. 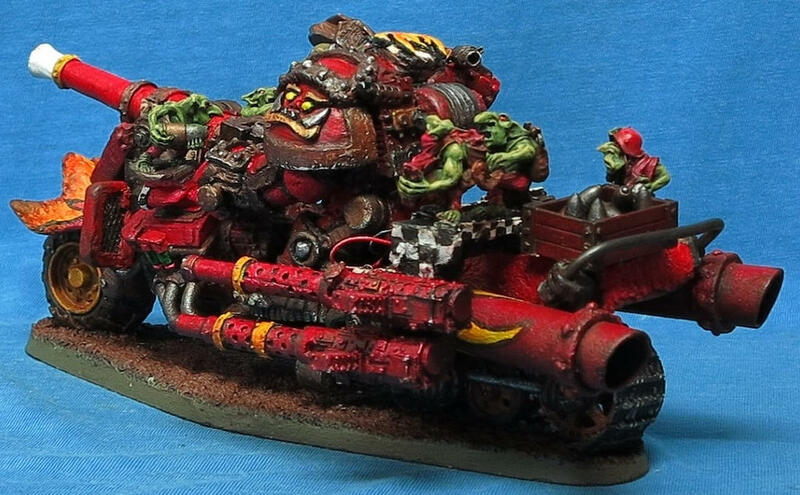 The grots loading the battlecannon for him is a nice touch, as is the 2E-style Evil Sunz paintjob, and the fact that you didn't bother with the silly princep-skulls. Wazdakka is just quintessentially 2E, why bother shying away from it? 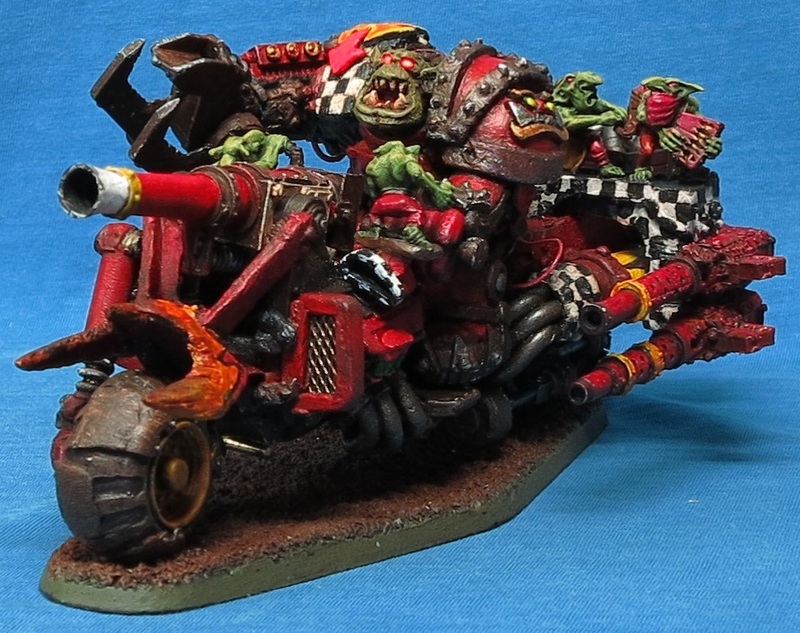 I also really appreciate the beastly shokk absorbers. 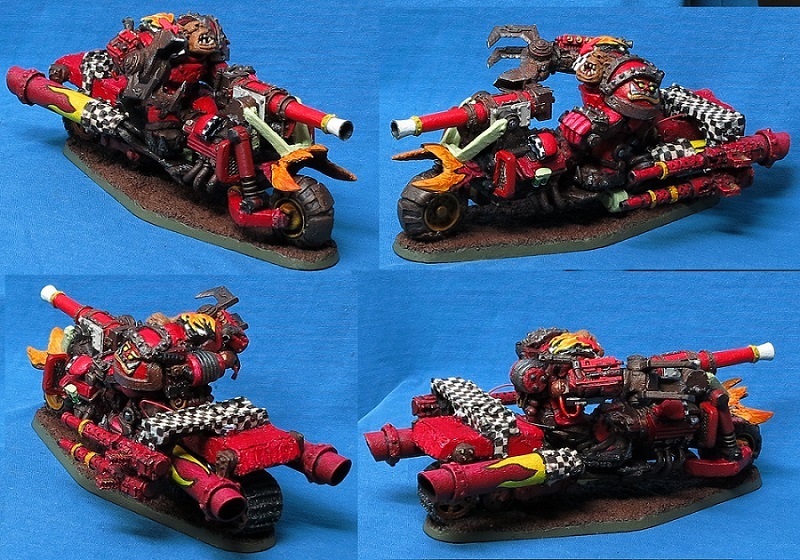 Probably still not enough to compensate for 2 tonnes of battle kannon and mega-armour going over a bump, but hey The only thing I think could have been better is I wish the front wheel was bigger. It's taken me this long to realise that that was bothering me. On the other hand, who cares? He's a beast! Any chance of a Barry shot with the Sunburnz some time? Cheers guys, Garslag - tried painting him 2nd Ed 'clean' earlier but it didn't convince me so I just oil-washed and repainted 'til he got to the state he's in now. Did consider the princeps' skulzz, would have involved making skull shaped moulds big enough to take clear LEDs and casting transparent white-ish resin around them, then having another go at making clear araldite/acrylic paint flames and then wiring the whole lot onto the back of the mudguard Decided that it would have just looked too fussy (and a bit too close to the ammo box ). Thanks for the picture, was wondering how well the trukk wheels fit onto the scrapjet. 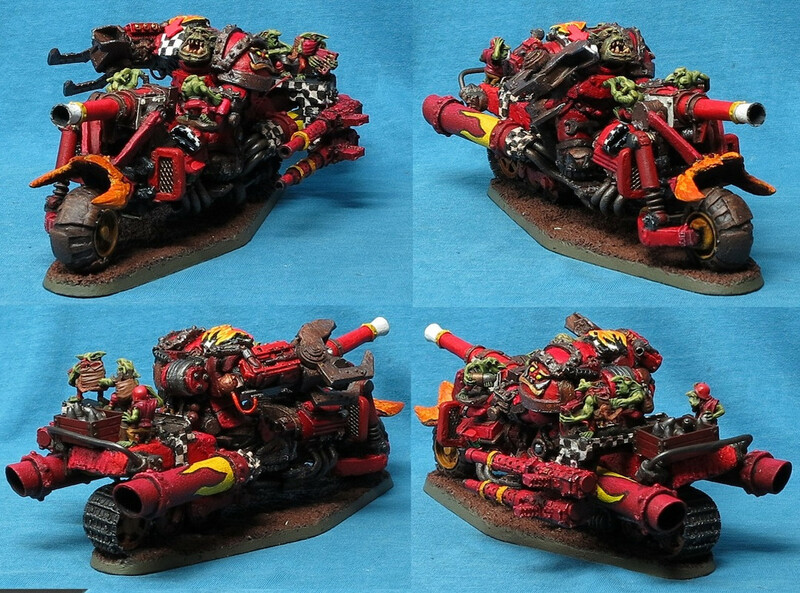 Much better looking than with the trakks - every proper mek would build a grot tank with those trakks anyways (or something else at least). Metal elitist & into game/level design. No worries Gitkilla, the trukk wheels were drilled out to match the axle stubs on the swingarms and then spaced out with Milliput to get the tyres far enough away from the swingarms and shockers. 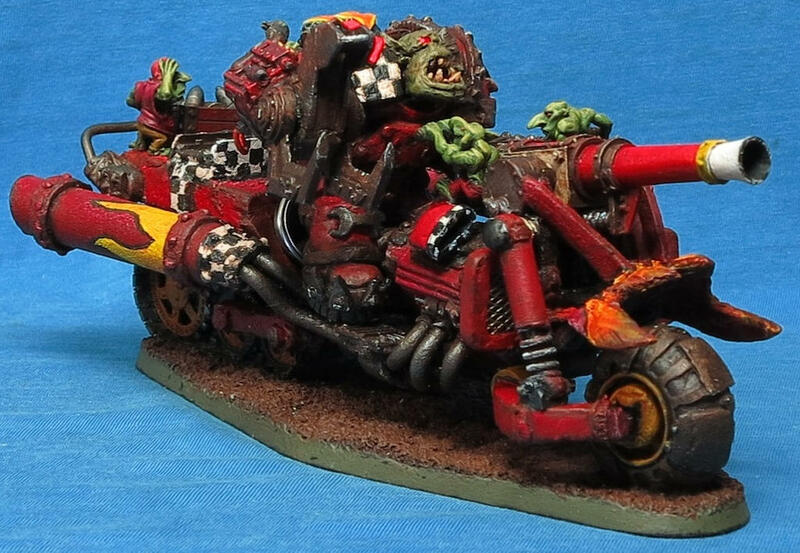 Still a bit sad that I couldn't think of anything better to do with it but it really doesn't lend itself to conversion work like anything with a proppa chassis does. Will you be adding more/better exhausts? While building mine I came to realize that this is a very lame excuse for a vehicle. It seemed that the mid designers didnt talk st all to the people who would write the fluff. 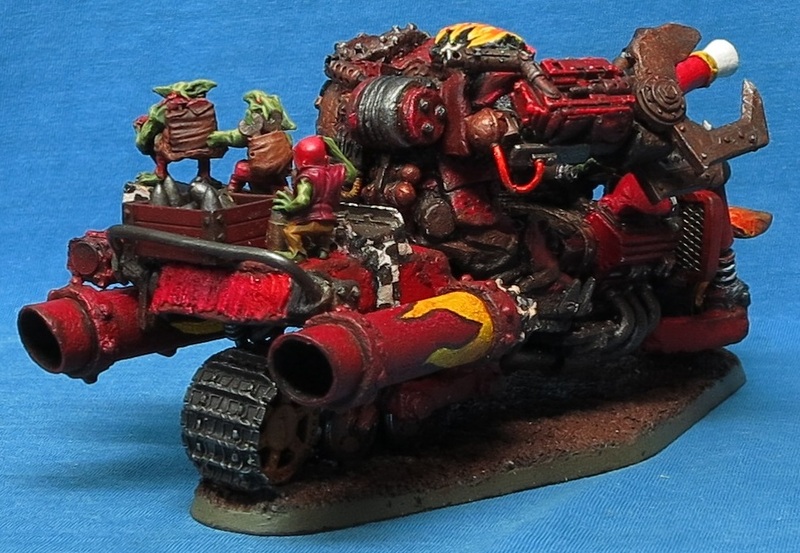 The write up says that its propelled by the exhaust and then the exhaust is weedy compared to the size of the hull not to mention the traks (never mind the wheels, though you could argue since they are near the engine there is some sort of drive train in there). 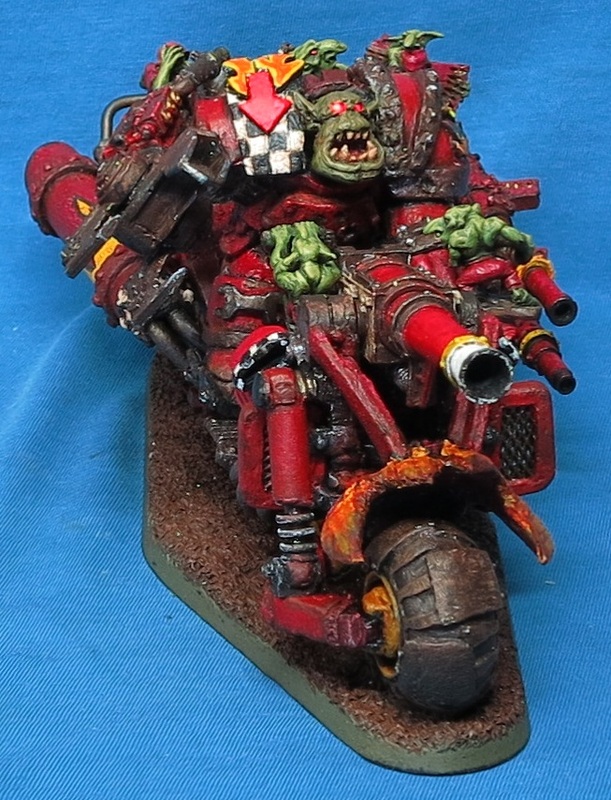 The grot turret really puts the kybosh on any rear thrust which is extra funny considering they dont give it any stats. Im sure given your Miliput skills youll be able to come up w/ some kind of exhaust array.